Sunny Lohmann hosts a politics and comedy mash-up with an irreverent, if sunny, take on the world. Is she Right or Left, Right or Wrong? You be the judge. Chavez is Dead, bwahahaha...Too Soon, or Not Soon Enough? This week, Sunny is joined by Mockarena and Daisy of ChicksontheRight.com. The ladies discuss a wide variety of topics, from the potential future Queen of England to Hugo Chavez's glorious demise. Federal Agency Acronym of the Week was: RETARDED. Everyone plays the new game that will sweep the country: Politicians or Beauty School Dropout? Sunny attempts--and fails miserably--to sit down and chat in a civil manner with Minnesota Congressman Keith Ellison. 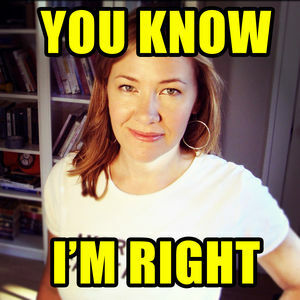 Sit tight and enjoy this very special extended episode of the You Know I'm Right Show! The KinderGarden of Evil with Evan Sayet and Vladimir Putin! EXPLICIT! The NSA, PRISM, Baby Arms, Mall Shooters, & Worse!